It appears 3D printing technology has already gone from new and useful to experimental and strange, and some people aren’t content with simple plastic printouts anymore. 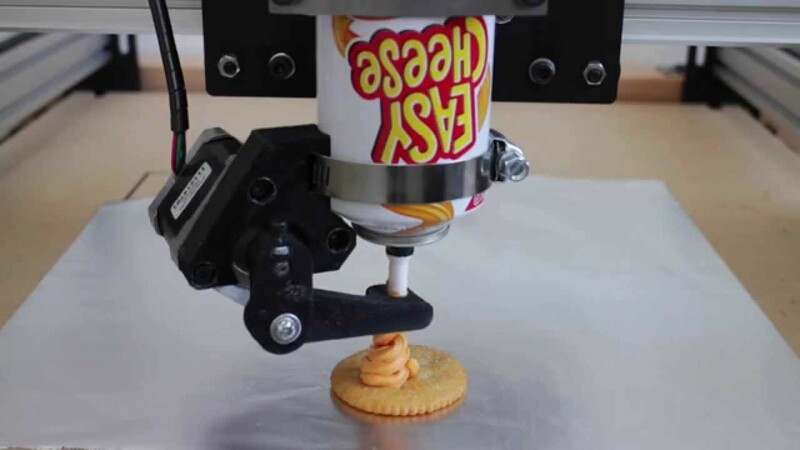 Chocolate printers have been a reality for some time, as well as the amazing pancake printer (aka the future of flapjack technology), but creating a Easy Cheese printer is proving to be a lot harder than anyone thought. Easy Cheese is why we dropped you Brits in 1776. Us hoi-poloi have finer things to distract us. Big Brother. I'm a Celebrity, Get Me Out of Here. X-Factor. A General Election. Hmm. I also burp when in the upright position. In England, only the royal family and Elton John are permitted to have aerosol cheese; not the riffraff. I already have far too many of them, thanks! "It Ain't Easy Printing Cheesy"